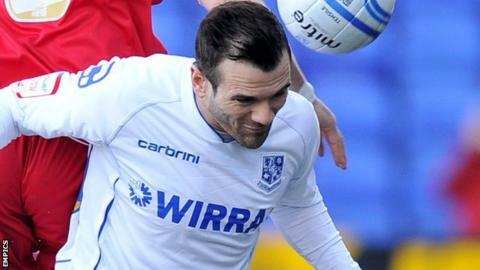 Promotion-chasing Kidderminster Harriers have made their fifth signing of 2013 by bringing in experienced winger Martin Devaney on a deal until the end of the season. The 32-year-old former Cheltenham Town favourite has been without a club since being released by Tranmere last summer. But boss Steve Burr has brought in a man with over 400 Football League appearances to his name. "I know Martin's experience will be invaluable to us," said Burr. "He hasn't been playing much football lately and it is an opportunity for him to come and earn that right to get into our team and show everybody what he's about." Devaney, who began his career at Coventry City, made his name at his home-town club Cheltenham. He played in their Division Three promotion-winning team in 2002, before a brief move to Watford was followed by six seasons at Barnsley, who he helped to promotion to the Championship in 2006, followed by loans at MK Dons and Walsall, prior to his move to Tranmere in August 2011. Devaney's arrival makes him the club's fifth signing since last month's club record £300,000 sale of Jamille Matt to Fleetwood. Loan strikers Greg Pearson (Grimsby), Amari Morgan-Smith (Macclesfield) and Nat Jarvis (Cardiff) have also signed, along with Gillingham midfielder Danny Jackman. Harriers are currently fourth in the Blue Square Bet Premier, eight points behind leaders Grimsby.